Dutch painting, dance and animated films have two things in common: they are artforms which rely on non-verbal communication, and they are known the world over. The Dutch are indeed accustomed to expressing themselves in visual terms and this means that they can empathise with other cultures and communicate without resorting to the spoken word. It is hardly surprising therefore that the Netherlands has long been a trading nation, with a finely-tuned sense for supplying exactly what is in demand. The export of animated films might serve as an illustration. Dutch animated films have won prizes at festivals in places as far apart as Annecy, Hiroshima, Ottawa, Stuttgart, Cannes and Berlin. Thanks to their artistic and visual qualities, the films can be appreciated by a wide audience without a word being spoken. On these pages you will find cels from very different kinds of Dutch films. Most of them were given to me directly by the animator, and thus everyone of these cels has a story and is very dear to me. These are the kind of cels that I will never part with. I also included some general information about the animators, as most of them are probably not known to an American audience. All images © and TM of the respective studios. You can click on the thumbnails to see larger images. 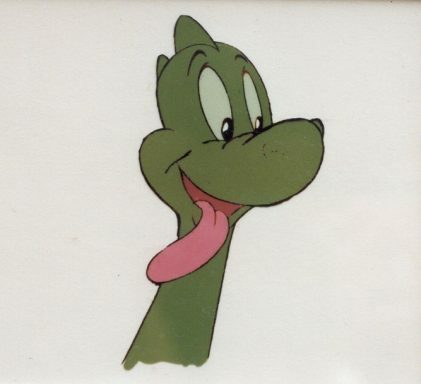 Original hand-painted production cel of Ollie B.Bommel from the first (and only) Dutch animated feature film "If You Know What I Mean", also known as The Bumble Film, produced by Rob Houwer and directed by Bjorn Frank Jensen and Bob Maxfield. Studio: Marten Toonder. In 1983 Toonder Studios made the lifelong dream of its founder Marten Toonder come true. 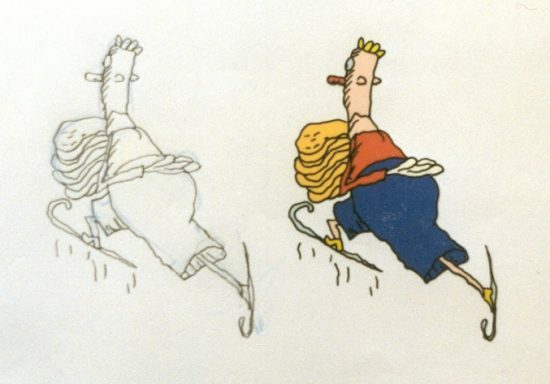 In association with Rob Houwer's Verenigde Nederlandsche Filmcompagnie, the first Dutch animated feature was produced, titled "If You Know What I Mean". It was based on Marten Toonder's famous daily newspaper comic Mr.Bumble. The film is reminiscent in some ways of Disney's features and there is an E.T.-type appeal to one of the main characters, Swellbelly. The cartoon characters have a long heritage of popularity in Holland and the differences between this film and Disney's are greater than the similarities; here the human beings look like animals rather than animals acting like humans. Main characters are Tom the Cat and Mr.Bumble, a rich, pompous, socially snobbish, kind and none-too-bright bear. He has an even more pompous valet. They all live in Rommeldam, which also has a mayor, a police chief, a newspaperman plus good citizens and their wives. This world is invaded by an egg, blown into town by a storm, from which emerges a Swellbelly, an unknowing offspring of a monster from the other side of the Black Mountains, who figures that the bear is his mama. The animation is well done and the characters appealingly drawn. Also the visuals have not been allowed to dominate the dialog, which is one of its great strengths. 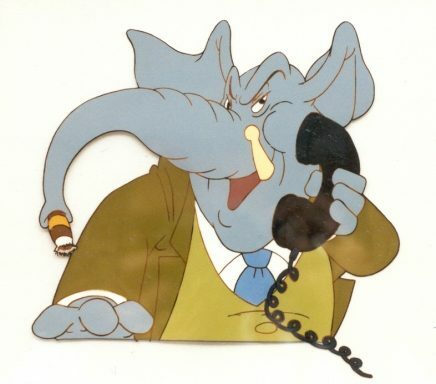 Original hand-painted production cel of Fanth, chief editor of the newspaper, from the Dutch animated feature film "If You Know What I Mean", also known as The Bumble Film, produced by Rob Houwer and directed by Bjorn Frank Jensen and Bob Maxfield. Studio: Marten Toonder. To read more about the first (and only) Dutch animated feature, see above. 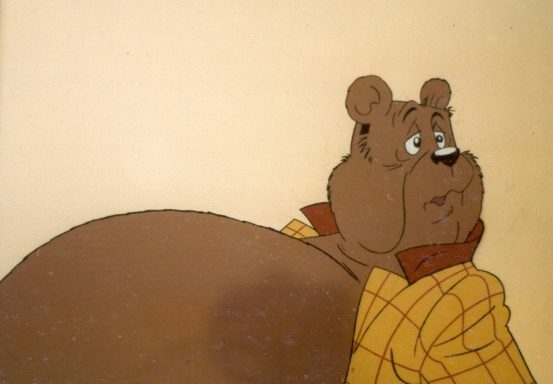 Original hand-painted production cel of Zwelgje (Swellbelly) from the Dutch animated feature film "If You Know What I Mean", also known as The Bumble Film, produced by Rob Houwer and directed by Bjorn Frank Jensen and Bob Maxfield. Studio: Marten Toonder. 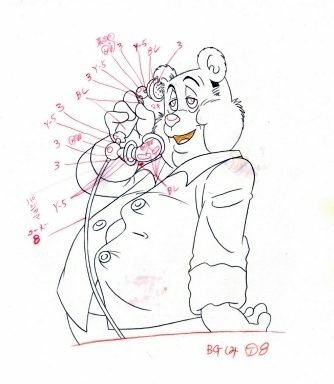 Production drawing with color notations of Ollie B. Bommel (Mr.Bumble) from the first -and only- Dutch animated feature film "If You Know What I Mean", also known as The Bumble Film, produced by Rob Houwer and directed by Bjorn Frank Jensen and Bob Maxfield. Studio: Marten Toonder. Original hand-painted production-cel of Bella from the Academy Award winning film by Börge Ring, produced by Cilia van Dijk. Signed and personalized by Börge Ring. Laserdisc-frame: B9863. Börge Ring was born in Denmark in 1921. He studied applied art and learned about animated cartoons in practice from Jorgen Muller and David Hand, the famous Walt Disney director. In 1952, at the invitation of Marten Toonder, he came to the Netherlands, where he animated numerous commercial cartoons until 1973. He went on to work on a freelance basis as chief animator of French, Belgian and Canadian cartoons such as "Asterix et Cleopatre" (1974), "Tarzoon" (1976) and the title sequence of "The Curse of the Pink Panther" (1983). More recently he also worked on Spielbergs "Were Back!" (1993). Börge Ring finally employed his mastery of the classic style of animation in a story of his own: "Oh my Darling" (1978). The film was awarded the Cannes jury prize the same year and was put forward for an Oscar nomination. Rings "Anna & Bella" (1984) finally won the coveted statuette. It also won six other prizes at various festivals. Börge Ring gave me this cel (and the other ones from "Anna & Bella") personally, when I visited him. I spent a very pleasant afternoon talking about animation, the lessons he learned from David Hand (the director of "Snow White and the Seven Dwarfs") in the 1950's in England, and a lot of other things. Original hand-painted two-cel set-up of Anna and Bella from the Academy Award winning film by Börge Ring. Sequence 7, scene 2, nr.27: Anna holding photo. Sequence 6, scene 3, nr.11: Bella holding bottle of wine. Laserdisc-frames: B13088 (Anna) and B12736 (Bella). 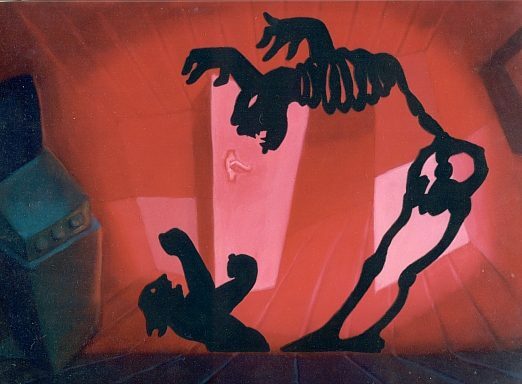 Original hand-painted two-cel progression from the Academy Award winning film by Börge Ring. Sequence 1, scene 5, level B, nr.29 & 31. Nr. 29 is signed by Börge Ring. Original hand-inked and hand-painted cel with matching drawing of a boy kating while carrying pancakes from this film by Paul Driessen, produced by Nico Crama for Nagasaki Holland Village. The Water People live partly above, partly below water. Their peaceful existence is threatened when their king wants to sell the water. Paul Driessen was born in Nijmegen in 1940, and studied at the Utrecht Academy of Arts. He began work on animation at the Cine Cartoon Centre in Hilversum in 1964, where he made television films. His stay in London in 1967 significantly stimulated his development, for he worked on the major animated feature "Yellow Submarine" by George Dunning. Back in Holland, he started designing and animating his first short film, "The Story of Little John Bailey". The years between 1970 and 1976 were inspiring ones, spent in Canada working on a freelance basis for the National Film Board and the Canadian Broadcasting Corporation. Since then Driessen has worked alternately in Canada and the Netherlands. His films have won numerous prizes at such important festivals as Berlin, Ottawa, Chocago and Toronto. In 1987 he went to Hollywood to receive the Annie Award, one of the most prestigious animation awards, for his distinguished contribution to the art of animation. This cel from "The Water People" was given to me by Paul Driessen personally, after I wrote him a letter, telling him how much I admired his work. I think "The Waterpeople" is, together with "Oh what a Knight", among his finest and most funny films. Paul Driessen is a master in the sparing and functional use of line and color. He has a unique style and particular brand of subtle humor. His use of figures such as silhouettes demonstrates the witty style of his drawing. Sound is also a vital element in his films. 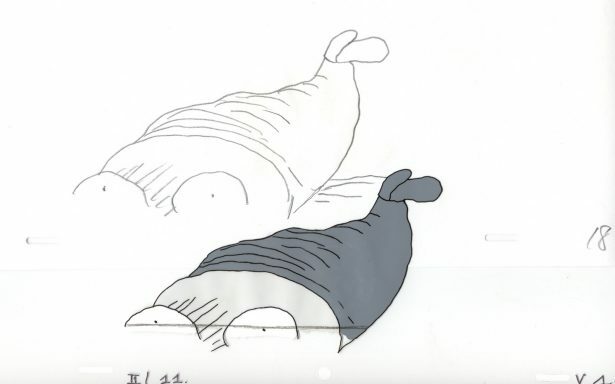 Original hand-inked and hand-painted three-cel-progression with matching drawings from this film by Paul Driessen, produced by Nico Crama for Nagasaki Holland Village. Paul Driessen is one of the few Dutch animators that have been succesful at building up an oeuvre of free films. His knack is to work in Canada half of the time (for the National Film Board of Canada), and the other half in the Netherlands (with grants from the Dutch Film Fund). With his self-willed style of drawing, that suggests more than it depicts, and his fresh sense of humour, he has gained international fame. One of these three cels has been signed by Paul Driessen, when I met him at the Holland Animation Film Festival in Utrecht in 2000. 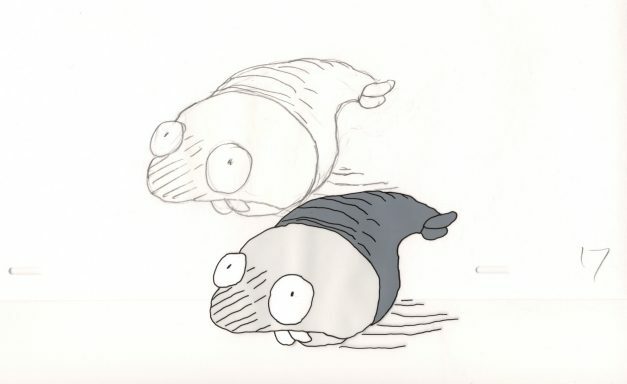 Original production-drawing (used as cel) from this animation-short, signed by the animator: Monique Renault. Woman is wayward as a feather in the breeze... is based on the famous aria from Verdi's Rigoletto, and is part of twelve shorts, released under the title "Opera Imaginaire". The Duke of Mantua dreams of nudes, languishing beauties. They move constantly. The women depicted recall famous paintings (Matisse, Ingres, Botticelli, Degas), revealing the beauty of a pose or the sensuality of a gesture. Monique Renaults film is a journey into male fantasies seen through the eyes of a woman. Monique Renault was born in Rennes, France, in 1939 and studied at the Ecole des Bauex-Arts of Rennes and Paris. In 1966 she worked in the animation department of Studio Klarow in Prague, and later with Peter Foldes in Paris, where she worked for the AAA Studio. In 1976 she came to the Netherlands. She made her first animated film in 1972. In an interview she once said: "When I was twelve I saw a Norman McLaren cartoon at school, and I found it so magnificent that I decided to make cartoons myself, instead of becoming a nurse or a nun." 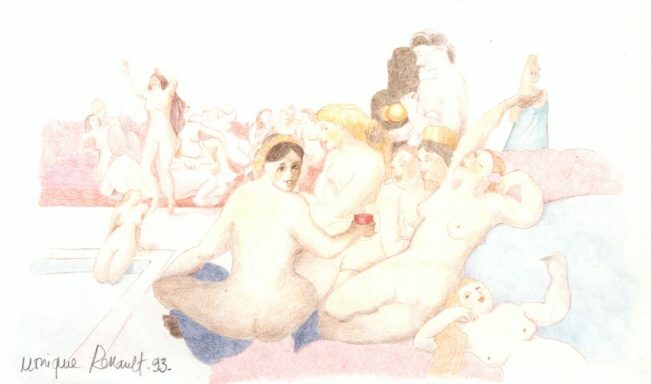 The relation between men and women form the main theme throughout her work. This drawing was given to me personally by Monique Renault, and she also signed it for me. 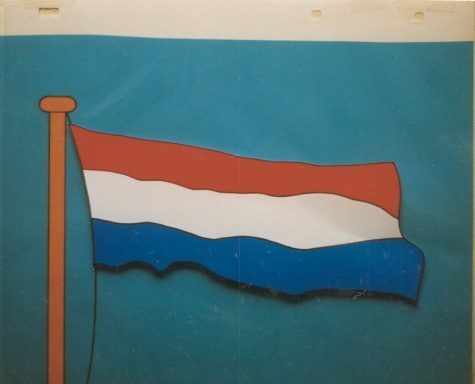 Production cel on its key production background from the 1974-leader of the popular music program Toppop, designed by Hans van der Jagt and directed by Geert Popma. This cel was given to me by Hans van der Jagt in 1997. The Toppop-television program was one of the best watched shows in Holland in the 70's. I was in my teens then, and have very warm memories of watching this music-show together with a lot of friends. Remember, this was in the pre-music video era, and the artists performed themselves in the studio, mostly with dazzling blue-screen effects, and accompanied by the ballet of choreographer and dancer Penny de Jager. Everyone in Holland who is 30 years or older, will recognize this truly Dutch icon from the leader of this immensely popular show. Multi-cel setup with key production background from a leader of this broadcasting-company (forming the letters V-A-R-A). Signed by the designer: Frans Schupp. Frans Schupp (who also worked on one of the leaders for the Toppop-show) gave me this setup personally in 1997. 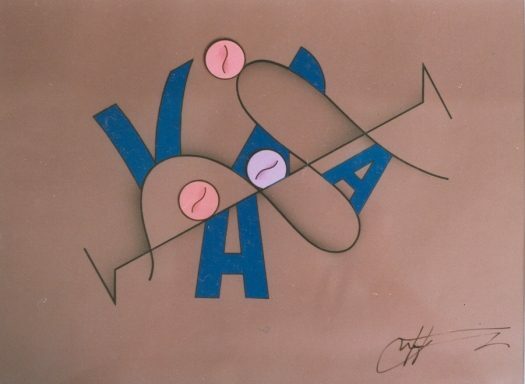 Production cel with cut-outs on a key production background from a leader of this broadcasting-company (forming the letters V-A-R-A). 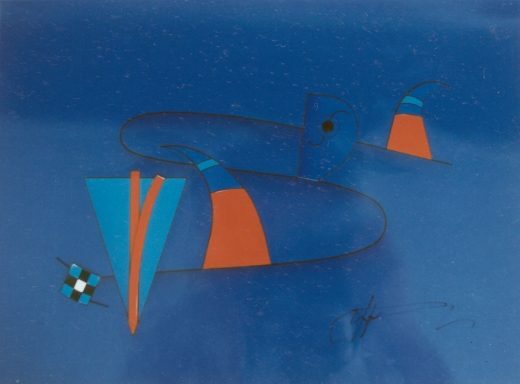 Signed by the designer: Frans Schupp. These bumpers were used inbetween television-programs, and were animated to music. I also have a copy of the storyboard for this one. 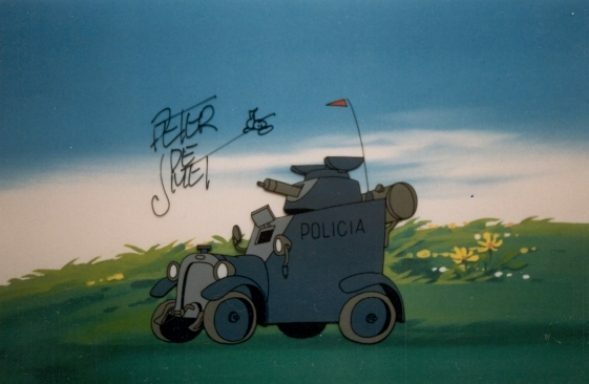 Production cel of a tank from the pilot of this (never made) series, based on characters by Peter de Smet. Produced by Lombard and made in the Belvision Studio. Colour-model cel of a squirrel from this short independent film made by Marten Toonder. Toonder only made two independent films before moving to more commercial work. He is considered to be the ‘father of Dutch animation’ and is sometimes rightfully called ‘the European Walt Disney’. Toonder passed away in 2005 and will be dearly missed. This film is a Chinese fairy tale about Prince Li Pai who asks a Golden Fish how he has to live. The cel is in great condition with the pegholes still intact. Two key setups from this debut film by Hisko Hulsing, about a tenant who is terrified by his landlord. The backgrounds were first painted on large panels, and photographically reduced in size to serve as the background for the cels. These setups have those original photographs. Hisko Hulsing majored in painting and animation at the Art Academy of Rotterdam in 1995. He started working on his first animated short “Harry Rents a Room” during an apprenticeship in the "Bratri v Triku" studio in Barrandov, Prague. For years he divided his time between working on “Harry Rents a Room” and financing the film by working on commercial animation-, illustration- and directing-assignements for commercials, videoclips, leaders, bookcovers and CD-roms. 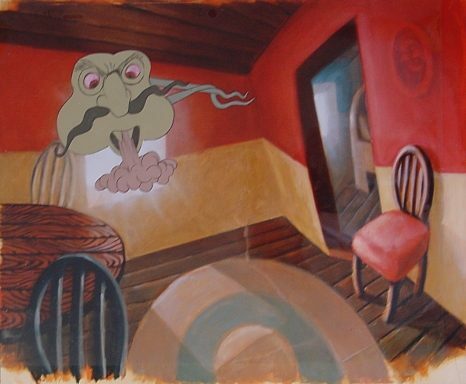 In July 1999 “Harry Rents a Room” was released in eight copies in the Dutch theaters together with “Existenz” by David Cronenberg and “Fear and loathing in Las Vegas” by Terry Gilliam..
Short film made by Piet Kroon, who later moved on to make a career in the States as a storyboard artist and animation director. He wrote the script for “DaDA” while he animated on Paul Driessen’s film “The Water People” (look for some cels from this film above). 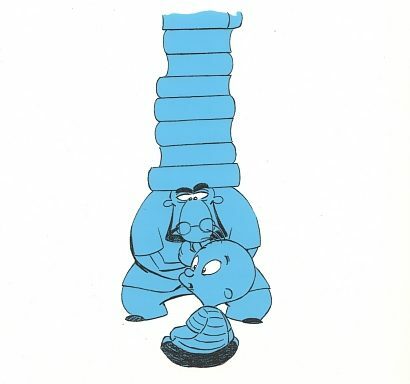 In “DaDA” everybody walks around carrying books on their heads. The more books stacked on your cranium, the smarter you are perceived to be. The story takes off when a little boy is born with a perfectly round head. To the horror of his parents no books will stay put, no matter what they try. Ultimately, they take their son to a hospital, where a learned scholar saws off the top of the kid's skull to study his brain. The doctor discovers the kid is really a genius. He realizes that it is not the books you carry around that matter, it is how you ‘process’ them and create something new out of them. The final twist of the film, that somehow seems to be especially shocking to American audiences (maybe because they are suckered out of a happy ending), is that the father feeds the brilliant brain to the cat. 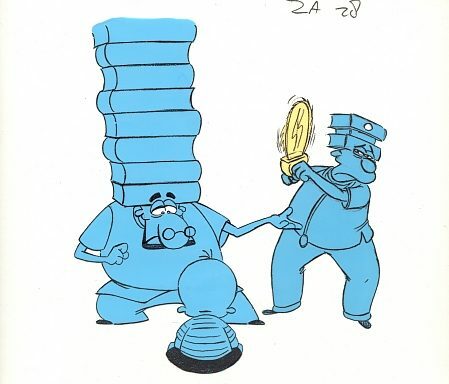 Because with the top sawed off, he can pile an infinite amount of books on his son's head. He'd rather have a kid that looks intelligent, than an intelligent child. I just love this film. It’s very ‘cartoony’ and has wonderful full animation. It won several prizes: best short at the Festival of Fantastic Film 1996, Special Jury Prize at the Espinho festival 1996, Second Prize for Best First Film at the World Festival of Animated Film in Zagreb 1996, Mikeldi d'Oro for Best Animated Film at the Bilbao Short Film and Documentary Festival 1995. Here are two production cels from “DaDA” from the scene where the father has taken his child to a professor to be studied. As you can see, the colour styling of this film is also very special. 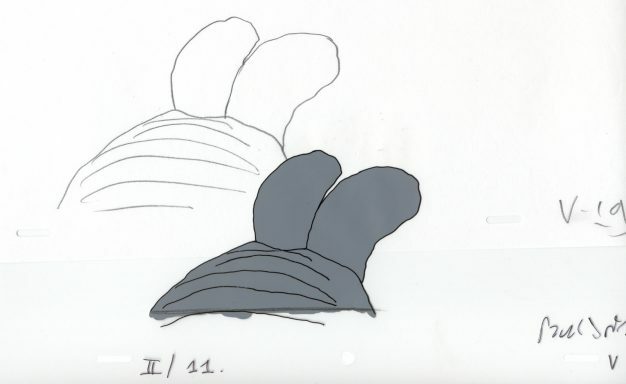 Storyboard drawing from this Academy Award (2001) winning short by Michael Dudok de Wit. This is one of the most beautiful animated shorts ever made, and has won more than 40 prizes around the globe.